Dungeon Crawlers Radio team is a part of R.A. Salvatore, Rise of the King Book Tour. Once again R.A. Salvatore returns to the show to talk about the latest Drizzt novel, Rise of the King. Rise of the King Is the second book of the Companions Codex, the latest series in the New York Times best-selling saga of dark elf Drizzt Do'Urden, R.A. Salvatore picks up the storyline of dwarf king Bruenor Battlehammer and his bloody feud with the orc kingdom of Many Arrows. As the changes wrought by the Sundering begin to take hold across the Forgotten Realms, the orcs of Many Arrows decide to take advantage of the chaos and lay siege to the dwarf kingdoms of the Silver Marches, including Mithral Hall. When word of the assaults reach Drizzt and his Companions, Bruenor—the dwarf king who had agreed to a treaty with the orcs more than a century ago—plots revenge. The show begins October 9th @ 6:00pm MST. Tune in to our show on Thursday October 2nd as we bring you a double dose of DCR awesomeness as we have the man who brought you The Dark Gods Series, author John Brown! We will be talking to John about his Dark Gods books and then we will follow that interview up with Forgotten Realms author Erin M Evans talking about her new book Fire in the Blood, which is an in direct follow-up to the third book in the Sundering series, The Adversary. Servant: The Dark God Book 1 The Beginning of a Towering New Series! A spirited blacksmith’s daughter accused of using the dark and terrifying sleth magic. The young man who hunts her. And the ferocious monster who only wants to be free. Trapped in a web of lies and ancient secrets, of right becoming wrong, the three must struggle not only against each other, but also a being of irresistible powers, a creature who is gathering her servants to usher in the impending human harvest. If the three succeed, they will save those they love the most. If they fail, the clans of the land fall with them. Curse: The Dark God Book 2 Mokad is Coming! Argoth and Shim have only a short season before Mokad comes to annihilate them. If they’re going to survive, they will need to raise an army of dreadmen and fell-maidens and train them in the lore. Argoth sends out a call to Groves throughout the western lands and begins to train Talen, Sugar, and three hundred others. But Mokad isn’t waiting. Mokad has already sent an armada with armies from four glorydoms. It has also sent its Guardian—a terrifying Divine everyone thinks is a sleth ally, coming with an invitation from Argoth himself to join Shim’s men. Outnumbered and outmatched, humankind is about to lose its first chance in an age to fight against those who enslave them. Unless, of course, this new Grove can find a way to do what no other has ever done before. Raveler: The Dark God Book 3 The War With Mokad Begins! Talen is in the hands of a powerful half-beast, a creature twisted for war, who is convinced the most merciful thing to do with Talen is kill him. But he might not have that chance, for Nashrud, the Divine sleth hunter, is hot on their trail. As they flee, the two can only hope the perils of the Wilds will save them, for if they are taken, both will become the tools of Mokad. Back on the coast, Sugar is sent to guide Argoth and a handful of warriors on a mission to assassinate Mokad’s Skir Master. To succeed they’re going to have to get through an army, patrols of dogmen, and at least 3,000 dreadmen. And that’s just in the world of flesh, for Mokad also has forces in the world of souls. The odds against Talen and Sugar are immense. At the same time, their powers are awakening. And what they learn just might give mankind a chance against the army poised to annihilate them. SCRIBE- award-winning author, Erin M. Evans, continues the riveting tale of her Sundering character, Farideh, as she becomes embroiled in a Forgotten Realms-flavored game of thrones. In a direct follow-up to the third book in the Sundering series, The Adversary, young warlock Farideh falls into the midst of a battle for the throne of Cormyr. As the war brought on by the Sundering rages across Faerûn, princes and princesses, wizards and rogues scheme to capture the seat of power of the Land of the Purple Dragon—with Farideh and her allies caught squarely in the middle. This episode of Dungeon Crawlers Radio has been brought to you by Audible. Visit http://www.audibletrial.com/DungeonCrawlersRadio for a free trial membership*. Due to the Labor day holiday and the fact that the Dungeon Crawlers Radio team is getting ready for Salt Lake Comic Con. Which is happening later this week. So we are rebroadcasting for your listening pleasure the amazing interviews of both R.A. Salvatore and C. Martin Croker. Check back this weekend for exciting photos & interviews. Dungeon Crawlers Radio welcomes to the show for the first time author, Jay Posey. To talk about his book, "Three". 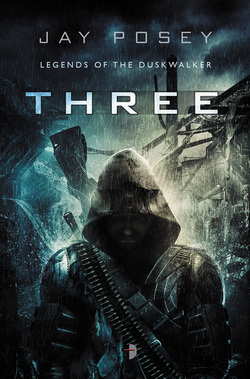 Three is a post-apocalyptic sci-fi book with Western themes and cyberpunk influences. The story follows Three, a lone gunslinger-type, as he escorts a dying woman, Cass, and her son, Wren, to a distant sanctuary, in hopes of finding Wren's father. Cass and Wren are pursued by some very bad people from her past. And to top it off, whenever the sun goes down, creatures known as the Weir come out and hunt anyone unlucky enough to be out in the open after dusk. This interview will be broadcasted live from Epic Puzzles and Games in West Valley City on Monday August 26, 2013 starting @ 6pm. Dungeon Crawlers Radio welcomes to the show for the first time author, Kyle Shoop. To talk about his book, "Acea and the Animal Kingdom". Twelve-year-old Acea Bishop was always the nerdy kid who would rather go to the library during recess to read bout animals instead of playing basketball like the other boys. Now, after waking up inside of an ancient kingdom strangely resembling a zoo, Acea is running from those same animals he used to love reading about. Worse yet? Acea's not just on a quest to get home - his mom and the dad-he-never-knew are both being held hostage inside by an evil sorcerer with a vendetta. 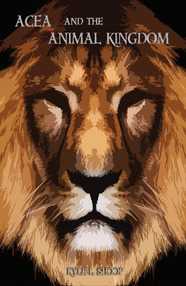 Realizing that his odds of survival and freeing his parents are dim, Acea raises an army of animals to combat the sorcerer and regain control of the kingdom. Follow Acea as he travels through the exotic zoo habitats and unlocks the secrets of the kingdom's mysterious past that hold the key to his fate. Acea has secrets. Big ones. He just doesn't know it yet. This interview will be broadcasted live on Thursday August 22, 2013 starting @ 6pm. 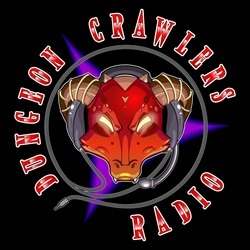 Dungeon Crawlers Radio once again returns to GenCon! While at this years GenCon in Indianapolis. Revan and Lord Flagoon sat down with the folks at Shenandoah Studios, the brains behind the biggest event at GenCon True Dungeon, and the wizards at Crafty Games creators of the Mistborn RPG. R.A. Salvatore Interview, "The Companions"
Dungeon Crawlers Radio would like to welcome back once again to the show author, R.A. Salvatore to talk about his latest book in the Forgotten Realms, "The Companions". 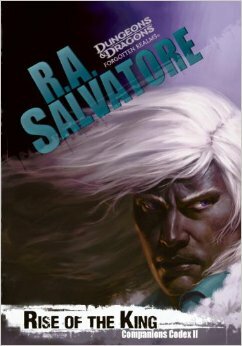 This latest installment in New York Times best-selling author R.A. Salvatore's beloved fantasy saga, The Companions moves Salvatore's signature hero Drizzt into a new era of the Forgotten Realms. As Drizzt's fate hangs in the balance, he reflects on the lives of the trusted allies who stood by his side throughout his early life--the friends now known as the Companions of the Hall. Meanwhile, the first stirrings of the Sundering begin. This interview will be broadcasted live from Epic Puzzles and Games in West Valley City on Monday August 5, 2013 starting @ 6pm. Dungeon Crawlers Radio is pleased to welcome Animator and the voice of Zorak, Moltar, Dr. Weird and many more, C. Martin Croker! C. Martin Croker (a.k.a. Clay Croker) has been in the animation field for over 25 years now, working with Cartoon Network’s ADULT SWIM block for much of that time. He has also provided graphics, animation, stories and voice-over work for the likes of Disney Imagineering, Cartoon Network, DC comics (Space Ghost, Scooby Doo, CN Action Pack) NASA, the Grammy Awards, the Cable Ace Awards, Warner Bros and many, many more. Clay created the format and design for Cartoon Network’s ADULT SWIM flagship show “Space Ghost Coast to Coast”, as well as supplying the voices of nearly 20 characters including villain-regulars Zorak and Moltar. Since 1995 he’s been running his Atlanta-based animation house, Big Deal Cartoons, Inc. where he has produced and directed the new animation for Space Ghost as well as many characters in several other ADULT SWIM shows including “The Brak Show”, “Aqua Teen Hunger Force” and this year Assy McGee (he has lent his voice to all these shows as well). He also designed characters and animated sequences for 2006′s” Aqua Teen Hunger Force Movie film for Theaters” –including voicing longtime ATHF characters Dr. Weird and his assistant Steve. 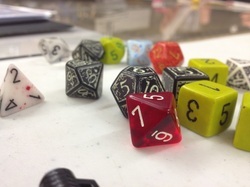 This interview will be broadcasted live from Epic Puzzles and Games in West Valley City on Monday August 5, 2013 starting right after the R.A. Salvatore interview. Dungeon Crawlers Radio would like to welcome to the show for her very first time. 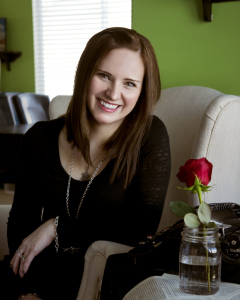 Local author, Teri Harman to talk about her new book, "Blood Moon". Teri writes a bi-weekly column for ksl.com, she also does regular TV segments on books for KSL’s Studio 5. When she isn’t reading or writing about other books, she is writing her own books full of magic and wonder. Her first book “Blood Moon” which is book one in the Moonlight trilogy. Release on June 22, 2013 and published by Jolly Fish Press. This is a new young adult/new adult witch fantasy. This interview will be broadcasted live from Epic Puzzles and Games in West Valley City on Monday July 29, 2013 starting @ 6pm.